Then one day we invited some company over and I decided to have another look at this dusty book on the shelves, to find something to complement the vegan lasagna I had made (we had forgotten to get dinner rolls at the store). To my surprise I found an easy recipe called Coconut Corn Bread using ingredients I already had at home, so I decided to modify the ingredients and give it a try. It was an intriguing combination: coconut and corn? I had made cornbread before but had never mixed both ingredients together before. It turned out to be a fantastic combination so I’m excited to share a modified plant-based version of this recipe now with you! These light, dairy-free and egg-free Vegan Coconut Corn Mini-Breads can be made gluten-free, because the recipe still works well if the white flour in the ingredients is substituted with a gluten-free specialty flour mix. For more of a coconut flavor, use a fortified original flavored coconut milk beverage, but if you don’t have this on hand, you can use an alternative plant-based milk, such as fortified original flavored soy milk or almond milk. Feel free to make a double batch of these little breads at the same time, because any extras can be frozen and saved for later. These Mini-Breads are so simple to make that you can bake them easily to serve with your meals at home, to give as gifts to neighbors or even make them in bulk for a party or potluck! A quick pop-in-the-oven vegan, dairy-free and egg-free bread recipe that pairs beautifully with a main course, salad or soup. Preheat the oven to 400 degrees F (200 degrees C). If not using paper or silicon muffin cups, lightly grease a 9 inch cake or loaf pan (or cover the inside of the pan with aluminium foil). Make the flax egg: Combine 1 tablespoon of ground flaxseed with 3 tablespoons of water together with a whisk or fork in a small bowl, then let it sit for 5 - 10 minutes. Before using, give the mixture a good mix for 2-3 minutes using the fork or whisk. In a separate bowl, mix the coconut milk, oil and honey together. Then add the flaxseed and water mixture to this bowl and stir until well mixed together. Gently combine the wet ingredients into the bowl of dry ingredients. Bake for approximately 20 - 25 minutes. Check at the 20 minute mark to see if a toothpick inserted into a baked batter muffin cup comes out clean. if it does, then the mini-breads are done (use a knife to check for completion if using a cake pan or loaf pan). Optional: at about the halfway baking point, I sprinkled some shredded coconut flakes on the tops of the cornbread muffins for an extra flair! 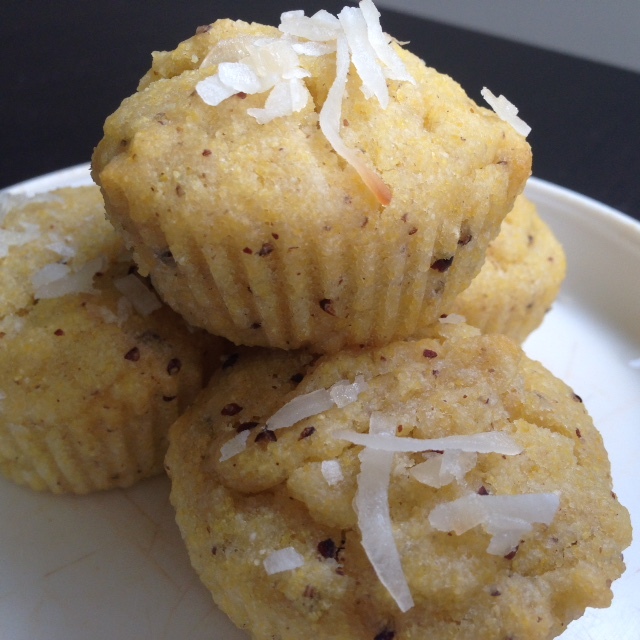 Remove the Vegan Coconut Corn Mini-Breads from the oven. Let cool for 5-10 minutes before serving. When using a gluten-free specialty flour mix to make these Vegan Coconut Corn Mini-Breads, know that the final product may remain a little lighter in color, so it is important to still check for baking doneness at the 20 minute mark, and remove them from the oven if done. This will prevent the batter in the muffin cups from over baking in the oven. I have not tried using gram or chickpea flour, or other gluten-free flours in this recipe yet, so feel free to experiment if you would like. These Vegan Coconut Corn Mini-Breads have a little light sweetness to complement the other parts of your meal. You may reduce this ‘sweetness’ factor depending on your preference, by using an unsweetened fortified coconut milk beverage (or alternative unsweetened fortified plant-based milk), using dry shredded unsweetened coconut, or adding in less honey in the recipe (or do the reverse if you would like more sweetness in the final product). Serve these little gems warm to complement a meal and if desired, add a little bit of vegan butter, jam or a drizzle of honey or maple syrup on top! ← Do Different Brands of Baby Cereal Provide the Same Nutrition?